The longest continuously inhabited part of Hong Kong there has always been some type of fishing community on the island. Pictured here in 1919 a vibrant fishing fleet has always had some degree of self sufficiency and community spirit. 1777 - Plague hits the island but is abated when the residents parade a Pak Tai image through the streets. Celebration of this event became todays Bun Festival. 1783 - Pak Tai temple originally constructed just next to the sea as this temple to the God of the North must always see the sea to be the protector of fishermen. While reclamation has meant that it is no longer next to the sea the view from the tmple is still unobstructed. 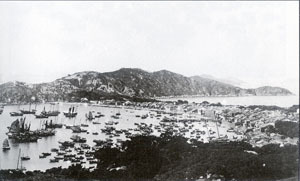 1920s - As colonial expatriate population of Hong Kong grows there is an interest in Cheung Chau as a place for holiday homes, and many buildings were built on the peaks for vacationing european families. 1998 - The Mini-Great Wall was built on the south east coast with pavilions giving grand views over the sea. 1989 - Pak Tai temple undergoes major renovation with all buildings substantially rebuilt, while maintaing the traditional original design and fittings.